However, convinced by her friends that she had talent, Diana applied at the university in Leipzig, got accepted, studied Photography and Media Art and graduated in 2010. Finally, February 2013, Diana and I were sitting in her studio reminiscing about her large body of works that already consists of numerous series of photographs, of which the image stays the same, its materiality is altered consistently, however. 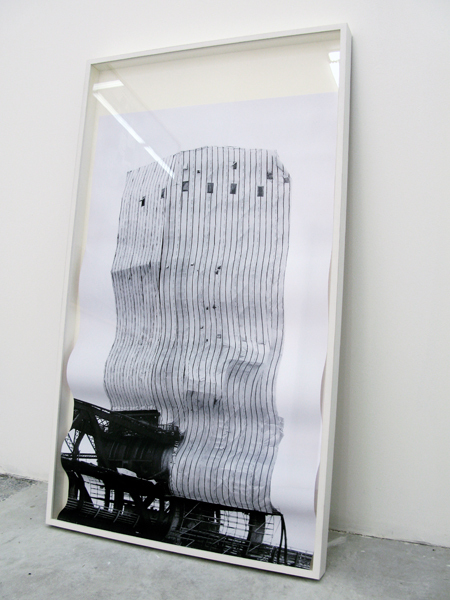 Thus, the picture is only the starting point of her works, like in her “Psychobuildings” series, where she prints out the image on normal paper, wrinkles, draws over, squashes and pastes it and repeats these processes until the point of perfection is reached, creating black and white paperworks representing deconstructed facades that are melting down or aging like wrinkled skin. „My interest is focused on the condition of imagination and memory as well as on the structure of desire and its inherent contradictions. The discrepancy between expectation and fulfillment is a central point in my work. I am especially affected by places and situations characterized through absence, imperfection and failure. Two hours were gone and so the grapes (by me) but Diana was still enthusiastically presenting the ideas that she is spinning for future projects. Hence, it is obvious that I really enjoyed my stay at Diana’s. I am always intrigued by the dynamic spirit of young artists and their passion of persevering their ideas, which Diana is not only storing in her head, but moreover in her numerous cardboard boxes. In the same way as most of her previous works new projects will also be put together out of found footage, like pictures from the fleamarket, books and magazines, and the hundreds of momentary images she has been collecting over the past years.